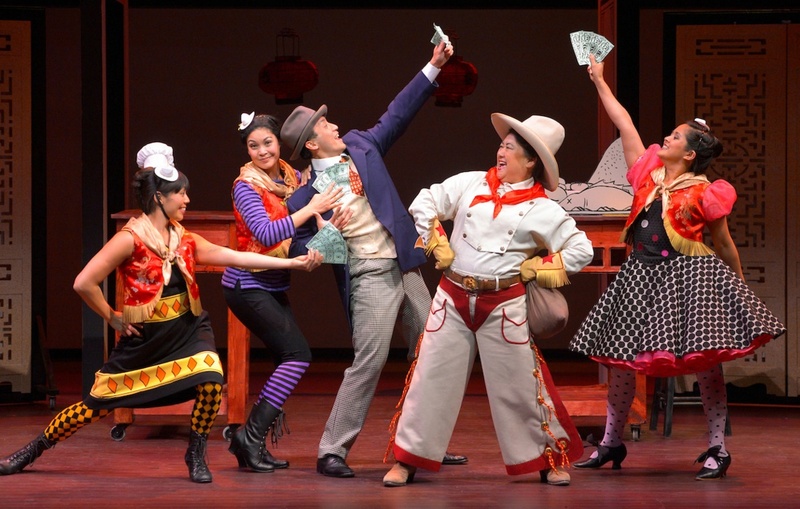 PALO ALTO — TheatreWorks kicks off its 48th season with the world premiere of “The Four Immigrants: An American Musical Manga” through Aug. 3 at the Lucie Stern Theatre, 1305 Middlefield Rd. in Palo Alto. Directed by Leslie Martinson, with book, music and lyrics by Min Kahng, this timely new musical is based on “Manga Yonin Shosei” by Henry Yoshitaka Kiyama, translated as “The Four Immigrants Manga” by Frederik L. Schodt. 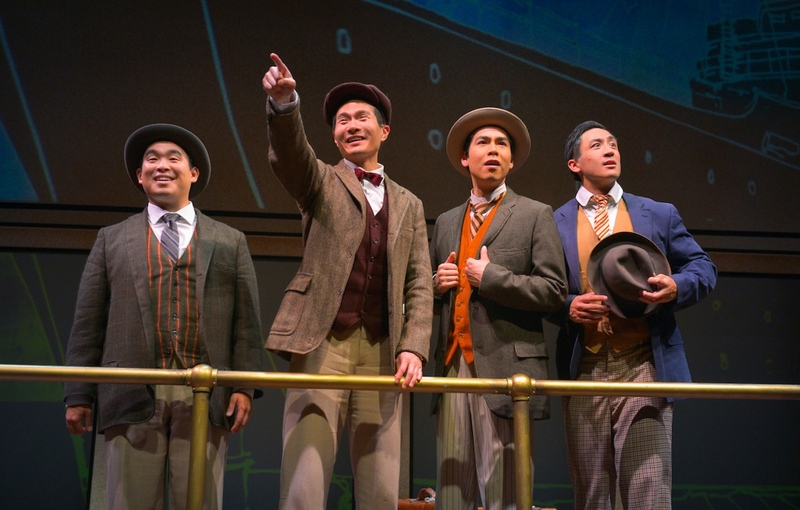 From a tumultuous earthquake to an exhilarating world’s fair, this broadly comic new musical chronicles the adventures of four endearing Japanese immigrants in a world of possibility and prejudice: turn-of the- 20th-century San Francisco. Driven by an infectious vaudeville and ragtime score, the quartet pursues their American Dream despite limited options in the land of opportunity. The cast: Phil Wong as Frank, Hansel Tan as Charlie, James Seol as Henry, Sean Fenton as Fred, Lindsay Hirata as Hana, Catherine Gloria as the Anti-Asiatic Leaguer, Kerry Keiko Carnahan as Kimiko, and Rinabeth Apostol as Elder. The runaway hit of TheatreWorks’ 2016 New Works Festival, “The Four Immigrants” is a recipient of the Edgerton Foundation New Play Award. Kahng, an award-winning Bay Area playwright, extensively researched the history of cartoons, Japanese American history, and theater and musical styles of the era before beginning to write the musical in 2014, working closely with the translator of Kiyama’s “documentary comic book,” which depicted the true adventures of four young Japanese men, including Kiyama himself, in America from 1904 to 1924. Schodt discovered Kiyama’s work in a library in Berkeley around 1980. After much research, he completed a translation of the book in 1997, and it was published by Stone Bridge Press in Berkeley. Thursday, July 13, to Saturday, July 15, at 8 p.m.
Sunday, July 16, at 2 and 7 p.m.
Tuesday and Wednesday, July 18-19, at 7:30 p.m.
Thursday and Friday, July 20-21, at 8 p.m.
Saturday, July 22, at 2 and 8 p.m.
Sunday, July 23, at 2 and 7 p.m.
Tuesday and Wednesday, July 25-26, at 7:30 p.m.
Thursday and Friday, July 27-28, at 8 p.m.
Saturday, July 29, at 2 and 8 p.m.
Sunday, July 30, at 2 and 7 p.m.
Wednesday, Aug. 2, at 2 and 7:30 p.m.
Thursday, Aug. 3, to Saturday, Aug. 5, at 8 p.m.
Sunday, Aug. 6, at 2 p.m.
Tickets range from $40 to $100. For more information, call (650) 463-1960 or visit https://theatreworks.org.